A brand-new concept has been launched in the UK cruise market. Guests on board will get to ‘tell the Captain where to go’, as they vote for the next port of call as the cruise progresses, from two choices every 48 hours. Guests on board Braemar’s 15-night ‘You Choose Your Cruise’ sailing, which departs from Southampton on 10th October 2015, will be able to vote for the next port of call as the cruise progresses, from two choices every 48 hours. The first decision that guests will make on this unique cruise is whether to point Braemar towards Vigo in Spain, or Leixoes in Portugal. As the cruise progresses, passengers will choose between Barcelona (Spain), where guests can enjoy some of the local bars and restaurants, or they can choose to visit traditional Palamós, on the Spanish Costa Brava. The options continue, with a host of Spanish ports, choosing between either cultural Valencia or Mallorca's cathedral city of Palma; then they must decide between the pleasant, ancient city of Cartagena, or the classic Costa Blanca harbour city of Alicante. Guests will then pick between Andalusian Cadiz (Spain), or opt to visit the Algarve region of Portugal, with a call into Portimão. In this western area of the Algarve, guests can take in the beautiful beaches or go shopping at one of the local boutiques. The final choice for guests on this unusual cruise is the Galician city of Ferrol in Spain or La Coruna, also in Spain, with its stunning old town; from here, guests can take a tour to UNESCO-listed Santiago de Compostela Cathedral. 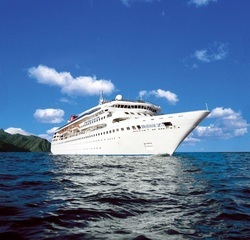 Prices for this intriguing ‘cruise with a difference’ start from just £1,199 per person, based on two adults sharing an inside cabin, and include accommodation, all meals and entertainment on board, and port dues.